PCND combines the best of CDN and P2P technologies to make an efficient and cost-effective way to handle cloud-based video. CDN is a content delivery acceleration network widely used in the video cloud industry. Recently a new technology called PCDN has emerged, offering P2P functionality in a manner that is fully complementary and integrated with CDN. PCDN introduces P2P technology for CDN, which reduces costs while ensuring reliable service capabilities, making it an ideal platform for video services. 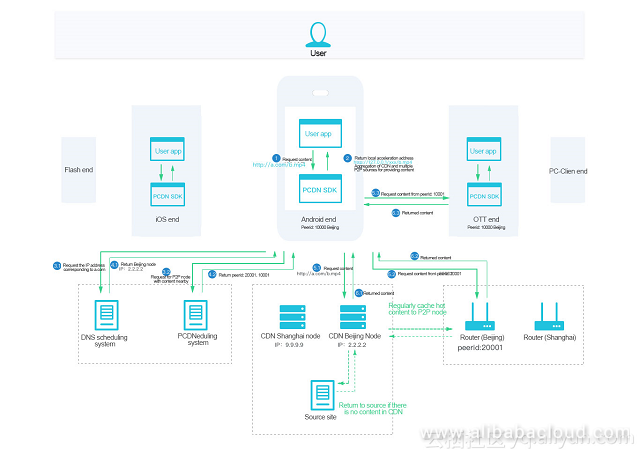 Alibaba Cloud PCDN (short for P2P + CDN) is a content delivery network based on P2P technology, in which P2P and PCDN work together in perfect unison to efficiently handle content delivery during heavy traffic. The distributed PCDN system relies on P2P core technology that seamlessly integrates with conventional CDN and cloud CDN, offering lower cost and higher quality when compared with CDN alone. This article discusses the features, architecture, use cases, and advantages of using PCDN. P2P Content Delivery Network (P2P CDN, hereinafter referred to as PCDN) is a low-cost and high-quality content delivery network service built by leveraging the massive fragmentation of idle resources in edge networks. You can access the service by integrating the PCDN SDK (hereinafter referred to as the SDK) to obtain equivalent (or slightly higher) CDN delivery quality, while significantly reducing delivery costs. It is incredibly useful in situations where you have to serve content in real time, such as ApsaraVideo Live, live streaming, large file downloads, etc. Provides a powerful and easy to use SDK that supports video on demand, live streaming, and large file download services through uniform interfaces that provide easy platform adaptation. Supported platforms include Android, iOS, OTT, Flash, etc. Supports various types of source formats like .mp4, .hls, and .flv for on-demand video streaming, and .hls and .flv for live video. Provides an intuitive management console and various OpenAPIs for quick configuration and real-time monitoring. Offers millions of service nodes across Mainland China (including more than 500 backbone nodes + millions of tip nodes), and integrates CDN and P2P technology to achieve multi-level network acceleration. The proprietary node scheduling system employs cutting-edge technology with more than 100 core technical patents. It offers a high-quality content delivery service through global scheduling for millions of nodes, data transmission route optimization, and proximate access. Supports multiple caching methods such as automatic discovery and cache mechanism and manual pre-push mechanism for hotspot content. Takes full advantage of P2P technology, offering obvious advantages in concurrent transmission, weak network optimization, download acceleration, and more. Supports content acceleration delivery for mainstream platforms and mainstream content formats, and it can achieve an equivalent (or slightly better) CDN user experience. Provides multiple optimizations for mobile terminals, and supports pure memory mode, in which TF/ROM don’t need to be written or read, with extremely low system resource occupation, and a similar power consumption to CDNs. Fully integrates Alibaba Cloud CDN security mechanisms and provides powerful anti-leech, anti-DDoS, and data security support. Uses the encrypted authentication mechanism included in the SDK to prevent unauthorized access. Provides powerful encryption for P2P node caching to prevent content tampering. Index Service: routes user requests to the most optimal location. ZooKeeper (Global & Local): reports service activity information to the scheduling service and dynamically updates configurations. Nginx Proxy: Nginx proxy service supports private protocols. Channel Service: stores information on individual files and addresses of terminals where those files reside, to provide the closest download location. Relay Service: facilitates P2P connection creation and communication. Hot Service: discovers and pushes hot files. When Is It Appropriate to Use PCDN? ApsaraVideo for VoD: long and short ApsaraVideo for VoD content. Live Streaming: streaming parties, games, live local television, and interactive shows. Large File Download: distribution of popular files that are larger than 1 MB, such as apps and audio files. Low Cost: P2P technology offers a cheap content delivery service, at about half the cost of cloud CDN and one-fourth the cost of conventional CDN (based on peak bandwidth). High Quality: Multi-level node scheduling achieved by combining CDN and P2P technology means that a request can be served by both CDN and multiple P2P sources at the same time. This resource redundancy improves service availability, which makes playback much smoother than it would be on a pure CDN, and the download rate for large files is massively improved. On an average, playback fluency reaches about 97% and latency is less than 1 second, which makes for a much better user experience. Mature and Stable: Provides access bandwidth exceeding 10 terabits/s, having withstood the test of time on platforms like Youku and Tudou, where it has been used for download and playback acceleration for massive number of concurrent users. It also possesses patented core technologies for intranet penetration, cache processing, seed management, and transmission protocols. Whether it's for live streaming or for hosting large static files, PCDN offers a more cost-effective and high-quality solution for your content delivery network. New to Alibaba Cloud? Sign up for an account and get up to $1200 New User Free Credit to try over 40 products and services. Or visit Getting Started with Alibaba Cloud to learn more. Note: As of June 2018, Alibaba Cloud PCDN is not yet available on the international portal. 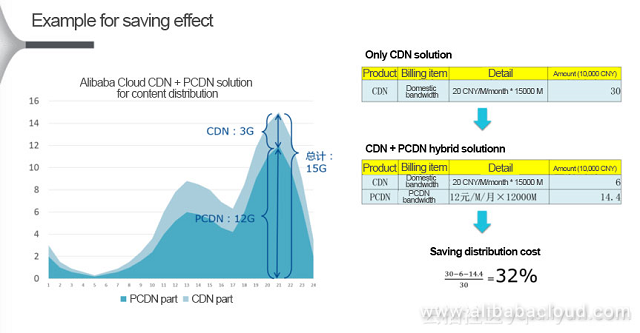 You can visit the PCDN product page on the Mainland China portal for more info (website in Chinese).